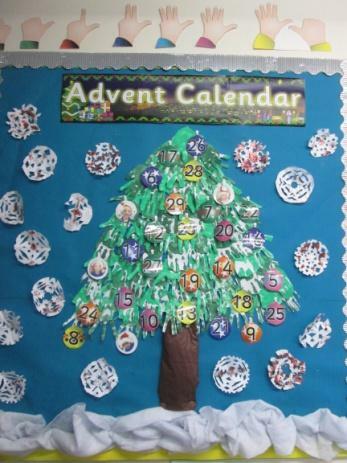 We started off the week with our Advent calendar! We opened up the first 2 windows as Advent had started at the weekend. We will continue to reveal all the baubles up to the end of term. Here is our advent calendar below. This week’s sounds are: ‘h’ ‘b’ ‘f’ and ‘ff’. We have revised all the sounds we have learnt so far and have been busy blending lots of words and revising the red words. We are all learning the sounds and words really well and our reading skills are improving each week. 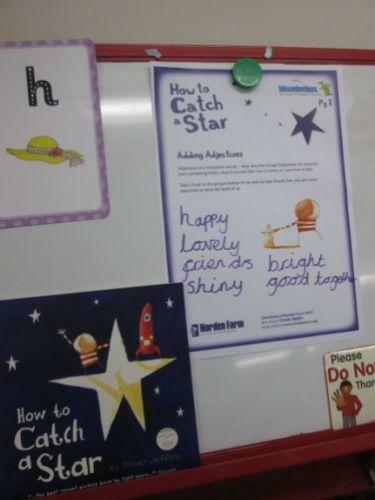 This week the focus story has been ‘How to catch a Star’ ready for our trip to Norden Farm. This is a lovely story and we have been doing lots of activities around the story from the Education Pack supplied by Norden Farm. Firstly, we described the Boy and his Star and how they felt at the end of the story. Then on Tuesday, we thought about what we would take with us on our own boats if we went on an adventure. On Wednesday, we thought about what we would pack in our lunch boxes if we were to go on an adventure to find a star. Of course, Thursday was the day of the trip itself and we watched the lovely performance. On Friday, we drew our favourite parts from the show that we really enjoyed. This week we have been learning to count up to 60 using the 100 square. We have also been learning about positional language and describing where objects are or describing our relative position such as ‘behind’ or ‘next to’. We did some activities using posters and the interactive whiteboard to describe where things are using the words ‘above’, ‘below’, ‘between’, ‘inside’, ‘outside’ and ‘around’. We also used words such as ‘forwards’ ‘backwards’ and ‘sideways’ when moving the frog on the screen. As part of our featured story ‘How to catch a Star’, the children helped to brainstorm some ideas of what they would like to do. This included, making a rocket like the boy’s in the story, making stars, making star and planet pictures and making rocket pictures and building our own rocket! We made a giant rocket with Mrs Wilkinson outside. Here we are below doing some of these things. This week to go alongside our story of the week, we made our very own star out of salt dough. Mrs Turrall cooked them at home in the oven as they take a long time but she showed us the dough that it was made from. We decorated our stars and then put ribbon on them so that we could hang them anywhere we wanted to. Here we are below busily concentrating on making dough and our stars. Thursday 5th December was the day of our very first school outing! We were all very excited to be going to Norden Farm theatre to see the play of ‘How to catch a Star’. The bus journey was really fun and the theatre was really lovely and we all enjoyed the show. Mrs Turrall said we all behaved really well and earned ourselves 2 marbles for our class reward jar! Here are just a few pictures from the show.